Back in September I was inspired to write Part 1 because of what I had observed in my inspections and a call that I received from a client. I am now inspired to write Part 2 for almost the same reasons. On October 18th and November 8th I performed two inspections that I was reminded of last week. Both sales closed last week coincidentally, December 9th and December 11th to be exact. One was a town house and one was a single family home. The townhome was built in 1996 and the single family home was built in 1935. From a home inspection and maintenance recommendations point of view both houses had damaged or substandard rain water management (piping) systems. Specifically there were issues with one or more of the following; Gutters, downspouts or the downspout extensions. Properly installed and maintained gutters, downspouts and downspout extensions are fundamental to keeping basements dry. 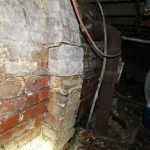 Of course a chronically wet basement can decrease the value of a house, damage property and belongings as it becomes flooded and potentially be a health hazard if the chronic moisture feeds the growth of mold. So with the title of this article, the introduction thus far and the following detail one can probably guess where this is headed. If you recall, the New Jersey area had a nor’easter storm on 12/9/14. According to the National Weather Service Philadelphia/Mount Holly Bureau, Southern NJ received approximately 2.5 inches of rain as of 7pm on Tuesday, December 9, 2014. What I’d like to do is translate that amount of rainfall into water volume and then demonstrate how potentially destructive that water can be if the gutters, downspouts and downspout extensions are not designed, built and MAINTATINED properly. 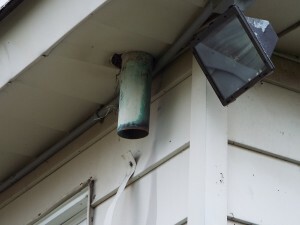 During the inspections for both of these houses, and of course in the written report, the topic of rain water management was discussed and documented because there was damage or substandard conditions to the gutters, downspouts or the downspout extensions. For one house, there wasn’t any downspout extension and therefore all the rain water coming off the roof was being deposited right up against the basement wall. For the other house it was a little more interesting. First, the 1935 house apparently was built without any gutters. I specifically asked the seller and he stated that when he bought the house it didn’t have gutters and the open soffit design of the roof/eave area would support the idea that gutters were not part of the original house design. On the 1935 house there was also a flat section of roof and that area drained to one downspout connection that was about 10 inches long (Photo 3) and in need of repair and redesign. In the report for the 1935 house it was even pointed out how the cascading water from the 10 inch, insufficient downspout was, “eroding” the ground directly below (Photo 2). Both clients were closing last week. The clients buying the 1935 house were having their pre-closing final walk through during the rain event on December 9th. The other was having their pre-closing walk through on Thursday, December 11th. Both clients called (on the 9th and 11th respectively) because they noticed wet basements in their final walk through. 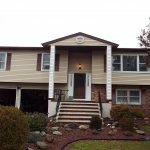 We reviewed the inspection’s findings and the report’s recommendations, photos, conditions found during the inspections and the recommendations to repair or add gutters, downspouts or downspout extensions as each situation required. Noting too that poor gutter, downspout and downspout extension maintenance could lead to water in the basement. I’d like to show you each finding individually and in the next section of this article, put the findings into different terms so that the potential water volume accumulation of a damaged or substandard rain water management system on a home can be better understood. One situation (Photo 1) was simply in need of a downspout extension (and maybe some soil grading). As noted in Part 1 of this article series, it would be great to extend the rain water drainage (downspout extension) to a minimum of 6 feet away from the foundation wall. The further the better. Photo 1 – Downspout extension and proper soil grading required. The other situation not only requires gutters but looking at the flat roof section of the house only, a proper downspout and downspout extension are required. The PVC pipe that fell off is significantly heavier than regular downspout material and over time gravity will cause the heavy PVC pipe to fall off. 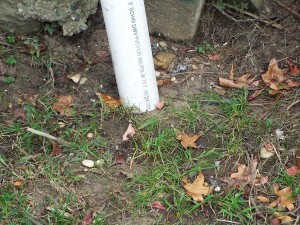 The lower part of the PVC pipe that was used as a downspout is seen in the photo below. The drain connection is in the next photo, Photo 3. 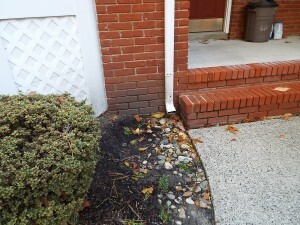 Photo 2 – Eroded soil and inappropriate downspout and no extension. Photo 3 – Only pipe draining from flat roof section. How much water might actually be dumped next to the foundation in each situation knowing that some of it will work its way back into the basement? 1935 House – The flat roof section of this house is approximately 12’ by 20’. Additionally the pitched roof section of the house, with no gutters or rain water management at all is approximately 30’ by 40’. The pitched roof section is a gable design so one half is sloped to the front and the other half is sloped to the back. Overall, this 1935 house covers approximately 1400 square feet of property. 1996 house – This is a center unit townhome and this particular house is approximately 18’ wide by approximately 30’ deep. This house covers 540 square feet of property. There were two downspouts in the front so in my calculations I will apply the theory that half the water flows to the front and half of that goes to the left downspout and half to the right downspout that is seen in Photo 1. So each one of the 2 downspouts in the front of this house manages the rain water from approximately 135 square feet of area. 270 square feet in total for the front half of the house. 1935 house. The flat roof is approximately 240 square feet. I actually convert everything to square and cubic inches to do the math but the bottom line is that in a 2.5 inch rain event, that would equate to 50 cubic feet of water landing on the flat roof. That is equivalent to 374 gallons of water that was collected on the flat roof and then deposited in one day at the corner of the basement in the 1935 house where the damaged downspout is located. Approximately 374 gallons of water were dumped in this spot on 12/9/14. On December 9th, with the 2.5 inch rain event, the 1935 house’s pitched or sloped roof shed a total of 1870 gallons of water. Half was shed to the front next to the foundation wall and half was dumped in the back next to the foundation wall. That’s over 2200 gallons of water that was dumped immediately next to the foundation wall of that 80 year old house because of damaged and/or substandard rain water management. Is it any wonder why some water made its way into the basement? The solution here (as stated in the report) is to A) Fix the downspout and add a properly sized extension and B) Add gutters, downspouts and extensions to the rest of the house. Proper soil grading is also a good option. For the 1996 house it’s not as dramatic but it helps demonstrate the need for properly functioning gutters, downspouts and downspout extensions. When we convert 135 square feet of roof surface area into gallons for a 2.5 inch rainfall event this equals slightly over 210 gallons of water deposited at the spot in this photo. And yes, if you pour that much water so close to the basement wall, some water will make its way back into the basement. Approximately 210+ gallons of water was deposited on the dirt in this photo from 2.5 inches of rain on 12/9/14. Soil grading is also important. If the soil is flat immediately next to the house, as it appears in the photo here, in a 2.5 inch rain event, each square foot of soil will have 1.7 gallons of rain fall in that 1 square foot area. Let’s apply these facts to the 1935 house. The 1935 house has approximately 164 linear feet of foundation at the perimeter. Roughly, if you consider a 3 foot wide apron of soil around the perimeter, that’s a 492 square foot apron of soil. Of course, any rain fall will land on this apron of soil. In the 2.5 inch rainfall event and my calculation that each square foot of soil will have 1.7 gallons land on it during this event, we’re looking at another 836 gallons of water that lands within 3 feet of the foundation wall! And other than proper soil grading, to pitch the dirt so the water runs away from the foundation, there’s not too much we can do about this. If we add it all together, this 1935 house had over 3000 gallons of water dumped within 3 feet of the foundation wall in one rain event on 12/9/14. YES, some of that water will make its way back into the basement. Make sure the overall grading of the land around the entire house is graded so that any surface water is likely to flow away from the house, not toward the house.